The Pro 3 Kit keeps it simple - making it an easy move from smaller ecigs. The Pro 3 makes our top 5 list due to its massive power in an extremely small device. The mouth-to-lung technology helps mimic smoking more than any other vape out there and the top-fill tank makes refilling a breeze. Super easy to use, plus it comes in several colors that you can customize to fit your style or mood! Must try if you want easy and simple! VaporFi has been at the forefront of the electronic cigarette industry for a few years now, and they have a device in just about every major category out there. 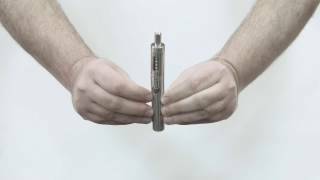 The “Pro” is their vape pen style ecig and is extremely popular, primarily with beginners. Due to this popularity, it definitely deserved a review, and breakdown of what this model delivers. VaporFi has a few great vape mods so it makes sense that their smaller devices should be just as good if not better. Many vape pen devices are labeled as being “good for beginners” because they are the easiest device to start with when dealing with e-juice on a first-hand basis. With disposables and cig-a-likes, the flavor cartridges handle all the taste aspects and are simply screwed on, used till its empty and tossed. The vape pen is the next step up, and you have to fill the tank with e-juice manually. However, there are a lot of vape pen devices (and vendors) that are just plain junk. And before you know it you are out another $20-$30 and quickly losing faith in whether or not e-cigs are going to work for you. The Pro 3 is the answer when searching for that solid vape pen option. Easy to use – built to last and backed behind one of the best warranties in the business. The Pro 3 is the follow-up model to (guess?) the Pro 2. The Pro was slightly smaller in size and battery strength but was in most top ten lists as one of the best e-cig options in the ego category. Thanks to the same quality feature the Pro 3 offers up. Once loaded up, a slight tap of the button and you're off. This thing hits very smoothly, and you won't have to take a big drag to get what you are looking for. A little goes a long way with this one. With most vape pen style e-cigs there are only a few aspects that you need to be solid for the device to be a winner; vapor/throat hit – battery life, and size. The Pro 3 covers all of these very well but because even the best e-cig will break from time to time, it's extremely important that the vendor backs up their product. This is why Vaporfi is one of the favorites because of their customer support – top notch – and a 30-day money back guarantees for peace of mind. This kit gives you the typical starter kit setup – tank – battery -charger. E-juice is purchased separately so make sure to check out their e-juice lineup before checking out. This one is slightly smaller than the prior Pro 2 model and only runs about 6 inches with the tank attached. Weight wise it's perfect, not too heavy, not too light. Once put together it feels solid with nothing rattling around. The charging cap cover is no longer needed as this model has the versatile micro usb port and is located on the side of the battery instead of the bottom so you can charge it being flat on the desk or standing upright. The Pro 3 offers a mouth-to-lung vaping experience that provides the closest sensation to a traditional cigarette without the guilt or stench. The kit inself contains the Pro 3 Battery, the Pro 3 Atomizer (2.0 ohm), the Pro 3 Tank, a Micro-USB Cable, and a Pack of Spare O-Rings (4). This new VaporFi Pro 3 Starter Kit looks remarkably stunning. It offers a sleek and classy appearance, while at the same time you gain a sense of durability due to its stainless steel structure. After a solid run with the Pro 3, I was very impressed with the overall product. Vapor output was solid, thanks to the dual coil atomizer (a new addition compared to the first “Pro” device). Battery life was better than most in this category, lasting me almost two days between charges, and the look of the device all made this one a winner. I would highly recommend it to anyone stepping up from their disposable or “cig-a-like” due to the ease of use and bigger vapor output compared to the smaller type e-cigs. One major aspect this newer version offers is the top fill design for refilling the tank – much less messy – and the new squared atomizer holes. This atomizer has more holes than any other atomizer for a vape pen in this category allowing more juice to flow and a more fulfilling throat hit than the prior models. The Pro 3 battery and tank are available in 8 different colors, giving you the option to really make it your own. You can pick your tank color and battery color individually, which ultimately provides up to 64 different style combinations. The size of the device made it easy to travel with – work – home – recreational events. Once again another awesome Vaporfi product in a long line of solid vaping devices that keeps these guys among the best when ranking vaporizers.